While I still have a lot of movies on my Oscar list, I’m starting to hit the point where some of these are getting to be a chore. There are still a few that I’m looking forward to seeing and I’m sure that there are some I am ambivalent about now that I’ll end up really liking. But it’s admittedly getting a little harder and harder to ramp myself up for some of these movies. After all, they’ve been movies I specifically haven’t watched since I started this part of this blog. In the Valley of Elah fits into that category. It’s not a film that I was actively avoiding; it’s simply a film that I didn’t really feel like I had much of a reason to watch. 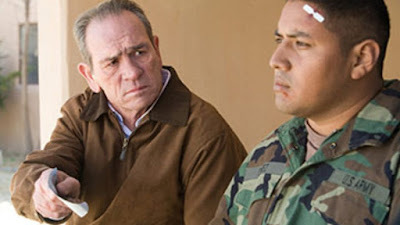 Ex-military policeman Hank Deerfield (Tommy Lee Jones) receives word that his son Mike (Jonathan Tucker) has gone AWOL after returning from Iraq. Hank tells his wife Joan (Susan Sarandon) that he is going to find their son. Hank drives off to his son’s location and begins his search for Mike, attempting to enlist the support of the local police. So, when a body turns up dismembered and horribly burned, it’s not a shock for anyone who has ever seen a movie that the body in question turns out to be Mike. Hank starts his own investigation, and here he does successfully enlist the support of local police detective Emily Sanders (Charlize Theron), who determines that the murder was committed in the police department’s jurisdiction despite what the military police would want to believe. This makes it her case, and the two set off to determine what happened to Mike and why it happened in the particularly grisly way that it did. I’m not going to go into any detail about what they find or where the investigation leads them. The reason for that should be obvious: it’s essentially the entire movie, and it’s all about uncovering the different pieces of the mystery. Naturally the military is going to obstruct as much as it can simply because it’s the military. Eventually, we are going to figure out what happened to Mike, and we’re going to learn that perhaps Mike wasn’t the boy scout in all ways that his father thought he was. Herein lies the major issue I had with In the Valley of Elah. This is, by all normal metrics, a well-made movie. The performances are good, and the film is improved by having a number of notables in small or medium-sized roles. These include such luminaries as Josh Brolin, Jason Patric, and James Franco. I also enjoyed seeing Barry Corbin, a “that-guy” character actor who is generally good in anything he touches. I’d have loved for him to have been in this a little more. That it’s well-made and consistently directed isn’t at issue here. What is at issue is the fact that this is a Paul Haggis film. Haggis treats his message the way that Oliver Stone treats his symbolism: with ham hands. I tend to like Haggis films well enough, but this is a problem that many of his films seem to fall prey to. Crash, universally derided as the movie that shouldn’t have won Best Picture in 2005, has its racism message delivered with all of the grace of a rabbit punch. It’s one of those movies where, once we got to the last meaningful scene, I predicted the closing shot almost perfectly because I knew the message that Haggis wanted to hammer home, and he seems incapable of doing this with any subtlety. The performances are good across the board, so it’s not terribly shocking that the reason I watched this was for Jones’s nomination for Best Actor. I find it difficult to completely dislike a film that has this cast list. That doesn’t stop me from continuing the ambivalence I had for this film before I watched it. Now that I’ve gotten to the end, it all seems like a bit “so what?” to me. Military mystery films aren’t an unknown subgenre, but the immediate comparison in some way is A Few Good Men, which focuses a lot on the courtroom. Here the court is an afterthought; what might happen in court is less important to the story than how Hank reacts to certain things or what is said before the bench. It’s not as compelling a story, though, no matter how apt that comparison becomes the longer the film runs. Haggis clearly wants to inject the film with a capital-m “Message,” and because the film gets to where he wants it to, he certainly gets that message delivered. It’s inelegant, though, and rather than asking real questions, it offers a polemic on the military, military culture, and military intervention. The hell of it is that I don’t even really disagree with the message. However, because it is done with so little tact, it’s hard to get strongly behind it. Haggis’s heavy hand dominates the entire production, making it one step away from a documentary indictment of, well, everything. Add to this that the name of the film comes from the story of David and Goliath, and we’ve got something that is clearly wanting to play in allegorical waters as well as tell its story, and I’m not convinced that works here, either. In the Valley of Elah isn’t a bad movie. I’m just not convinced it’s a very good one. Why to watch In the Valley of Elah: Some good performances. Why not to watch: Paul Haggis is particularly heavy-handed with this one.